We’re still a good few months away from the hustle and bustle of the holiday season (and it’s still over 90-plus degrees outside — eek ), but I suppose it’s never too early to start getting ready for it! Well, I’m not actually getting ready to make holiday gifts or anything just yet. But I am getting ready for a major holiday / year-end cleanup I’m planning to do in the coming month. My plan is to further reduce the things that are taking up the precious real estate in our apartment (and wipe down every nook and cranny of the place), in an attempt to begin the new year with a fresh, minimalist mindset. My immediate goal – use up the yarn stash (or at least assign a project to them) or donate them to charity. Since my inventory consists mostly of single skein, I decided to knit up some hats and gloves / mittens to reduce the load! Enter — a pair of super easy fair isle fingerless mittens! Note: The measurements below are for relatively small hands. Make sure to take a measurement of your wrist and hand circumferences to ensure that the mittens fit comfortably. Also, you can adjust the length of the mittens if you want something longer to cover your entire arms! 1. Cast on 44 stitches. Rib stitch (k1, p1), using Color A, until the panel measures about 2.5 inches. 2. Stockinette stitch (Row 1 k, Row 2 p, repeat), alternating between Colors A and B, until the panel measures about 4 inches. Note: Remember that when you’re doing a 1 x 1 fair isle, you pick up a stitch from the opposite color yarn. So for example, if Color A is on your left needle ready to be knit or purl, make sure to pick up Color B from the strands. I had to think about this for a moment because it’s the opposite of when you’re knitting fair isle in the round. 3. Cut Color B, leaving enough yarn to weave in the end. Rib stitch, using Color A, until the panel measures about an inch. Bind off loosely. 4. Fold the panel into two, facing wrong sides together. Using a tapestry needle, stitch two sides together until it reaches 3.5 inches. Cut the yarn and weave in loose end. 5. Leave a 2-inch opening for the thumb. Stitch two sides together, until you reach the end. Cut the yarn and weave in loose end. You’re done! This is probably the simplest way to make the fingerless mittens since it requires no shaping, and because there’s no shaping, it lacks a little bit of the sophistication that comes with a more complex pattern. I might try knitting the same pattern in the round next time to avoid sewing together the seams, and make a decrease from the top of the thumb hole so there will be a nice shape on top. But I’m very happy with the pair! Half of two skeins down. 452,952,241 more to go (okay, I’m just kidding there — I don’t have that big of a stash)! My BFF Maya recently requested a custom knit bag with a 1 stitch x 1 stitch Fair Isle pattern, like the beautiful Arctic Wrap from The Purl Bee. She saw and felt the actual wrap on our recent trip to Purl Soho and fell in love with it. I think turning it into a bag is a marvelous idea and I’m delighted to make it for Maya, but I panicked a little because I’ve never knit a Fair Isle pattern before. Over the weekend, I dusted off a few skeins of leftover Amy Butler yarns and made itty bitty baby hats to practice the pattern. I didn’t want to commit to a large project so I settled on the hat … but I had so much fun with it that I ended up knitting three in two days. I knit as I went, with no pattern, which allowed me to make them very quickly. I think I’m now ready to knit that custom bag for my BFF! I’m no expert in pattern writing but if you would like to try making the hat, here it is! It’s a great solution to use up your yarn stash, especially if you have some half-used skeins you didn’t know what to do with! Note: The first number in the pattern is for the small size (pink) with a 14 inch circumference; the larger size (gray and yellow ones are the same size), in parenthesis, is for a 16 inch circumference. Using circular needle US size 7 in 16 inches, cast on 80 (88) stitches with Color A (pink). Knit 2, purl 2 in a round and repeat this rib stitch until it measures about 2 inches. 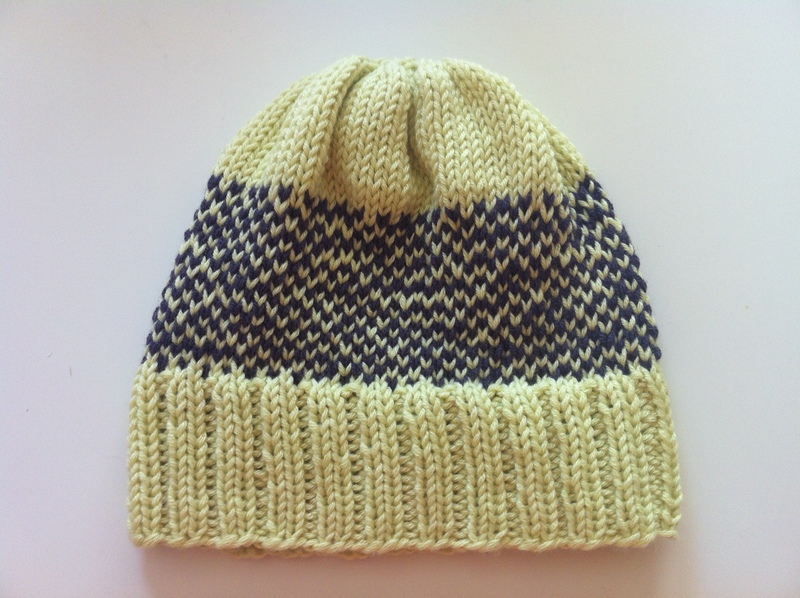 Now, add Color B (yellow) and knit, alternating colors at each stitch. You might need to M1 at the end of the first row to avoid repeating same color twice. 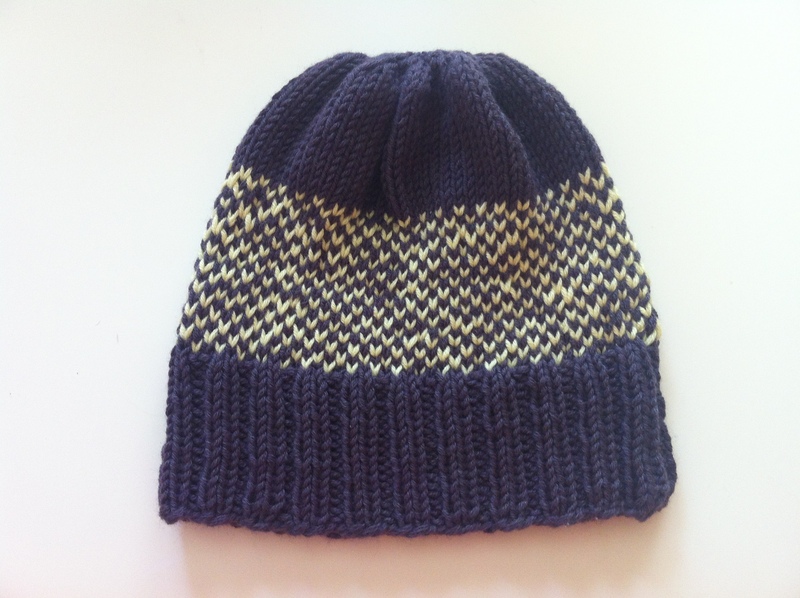 Continue to knit until the entire hat measures around 4.5 (5) inches. Note: Because you’re knitting in a round, you don’t have to worry about purling the alternate rows. You can knit all the way around to create a stockinette stitch. Cut off Color B. Using Color A only, knit for 1 (2) inches. At this time, the hat should measure around 5.5 (7) inches. Row 1: k2tog, k2. Repeat this for the entire row. Change the circular needle to double pointed needles. Note: If you are left with uneven number of stitches, simply stay as close to the pattern as possible. Row 2: K2tog, until you are left with one stitch. Bind off lose ends. Add a pom pom on top (optional). I ran out of yarns but I would have loved to put it on the top! Same as the hat above, in contrasting colors.